The Narrato Journal iPhone, iPod Touch, and iPad App adds social networking-inspired tools for a more timely iteration of journal keeping. Social links like Foursquare and Instagram provide you with a constant source of inspiration, and the emoticons and engagement features are reminiscent of Tumblr and BuzzFeed interactions. But, it’s your private journal – for your eyes only. You create an account with an email log-in. If you authorize pop-up notifications, the Narrato iPhone app will remind you to update journal daily, occasionally, or not at all. The pop-up notifications coupled with a location services authorization allow it to suggest you log your impressions of a specific location. You can connect with Twitter, Instagram, Foursquare, and Moves for further inspiration reminders. These authorizations prevent you from ever feeling the heavy burden of an empty screen. The home screen for the Narrato iPhone app is well organized. The top menu bar’s line icon opens your profile, journals, and settings from a list that slides down from the top of the screen. Your daily journal is listed next with your location and weather. Journals you create follow in a vertical list, or you can add one by touching the plus icon in the middle of the screen. The bottom navigation bar is the home to editing tools – a icon for text, camera icon for photos and in-app camera, emoticon for moods, location icon, and a dotted icon to access the camera roll. The bottom navigation bar at the bottom of the screen is more effective when you access it from a journal writing screen, but in its home screen location it also serves as a source of inspiration. 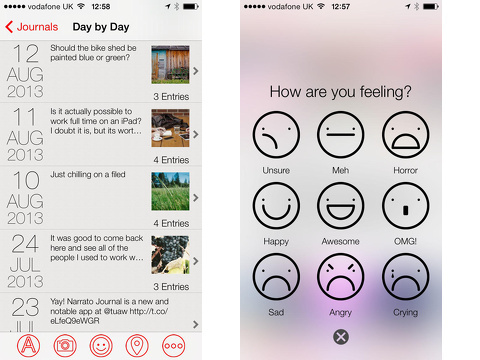 You touch the day to add details about your day, or you press the plus icon to create a new journal. You add a cover photo and name your journal. Then, you just start using the tools. For every tool you use, you can add text. The interface is similar to using iMessage. You touch the camera icon, add a photo, type your text, and press done. Its date and time are stamped automatically. If you want to change the date and time, you can tap the more icon at the top of the screen to adjust. You can also change the journal where you are entering the impression. Like you use emoticons in iMessage, you tap from one of the following selections – unsure, meh, horror, happy, awesome, OMG!, sad, angry, and crying – then add the text to explain your feeling. When you tap the location icon, a list of nearby places appears. You select one, then add text. The journal interface is intuitive, familiar, and successful. The Narrato iPhone app is a free download from the iTunes App Store, but you must purchase an upgrade to continue use and access cloud sync. There are currently four packages. The awesome subscriptions include unlimited storage and are priced at $4.99 per month or $39.99 per year. Pro subscriptions have monthly storage limits and are more reasonably priced at $.99 per month or $4.99 per year. The Narrato Journal iPhone, iPod Touch, and iPad app is what Bridget Jones would use now. For those moments where you say, “Please don’t post this on Facebook” or you think, “I can’t believe she said that on Facebook,” the Narrato iPhone app gives you a social-style outlet, but it isn’t blasted out for your boss, your mother, and your nosy neighbor to see. 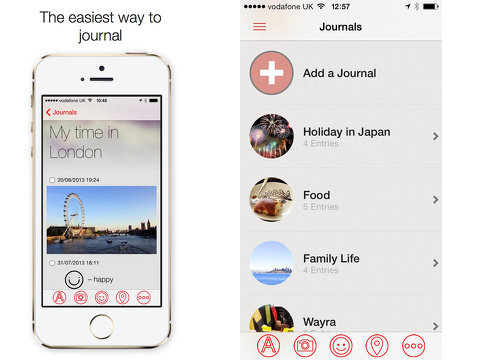 AppSafari review of Narrato Journal was written by Jenni Ward on November 19th, 2013 and categorized under App Store, Fun, iPad apps, Notes, Photos, Productivity, Travel, Universal, Utilities. Page viewed 4279 times, 1 so far today. Need help on using these apps? Please read the Help Page.